While I am busy in the Craft Zone making projects for upcoming blog hops (shhh, the projects are a surprise! ), I am reprising a post from last year when I had fewer followers. This is a dimensional paper piecing. First I made the peony using pink cardstock. I cut 4 five-petal flowers, each 1.5" in diameter. I cupped each of the flowers and then curled the edges of each flower to give them dimension. I think if I were to do it over again (and if I had the ink color I wanted), I would have inked the edges of the flowers first. I stacked the cupped flowers together, pinching them at the flower's base to give it dimension. I hot-glued the flowers together at the center and set it aside while I decided about the card's base. I found this lovely mint green paper with the pastel birds among a stack of favorites. There were just two sheets of this paper in the collection, and I decided to use both of them. For the background, I cut out the image to size, highlighting the image of the birds in the floral tree. (The rest of the paper is solid mint green.) I ran the paper piece through the leafy Cuttlebug folder twice -- first on reverse to deboss, and secondly on the front of the imprint to emboss. I feel this gives the image more realistic texture. Then I fussy-cut the images of the birds, leaves and flowers from the paper print (of the second sheet) so I could use them to layer atop the image I had embossed/debossed. I gave extra texture cuts to the birds' tail feathers and then decided to adhere the first bird at a lower level than the second; the second I raised with pop-dots. I curled the tail feathers as well as some leaves and flowers, to give dimension. Next, I made a matching peony bud by cutting and curling one of the pink petals cut from the larger flower. I mounted the large peony on the upper left of the card, using hot glue for stability. I then created a hot-glue and gold bead ball to use as a center-point accent for the lower left flower, and a smaller one for inside the bud. (You may not be able to see the beads in the bud too well in the picture -- sorry!) 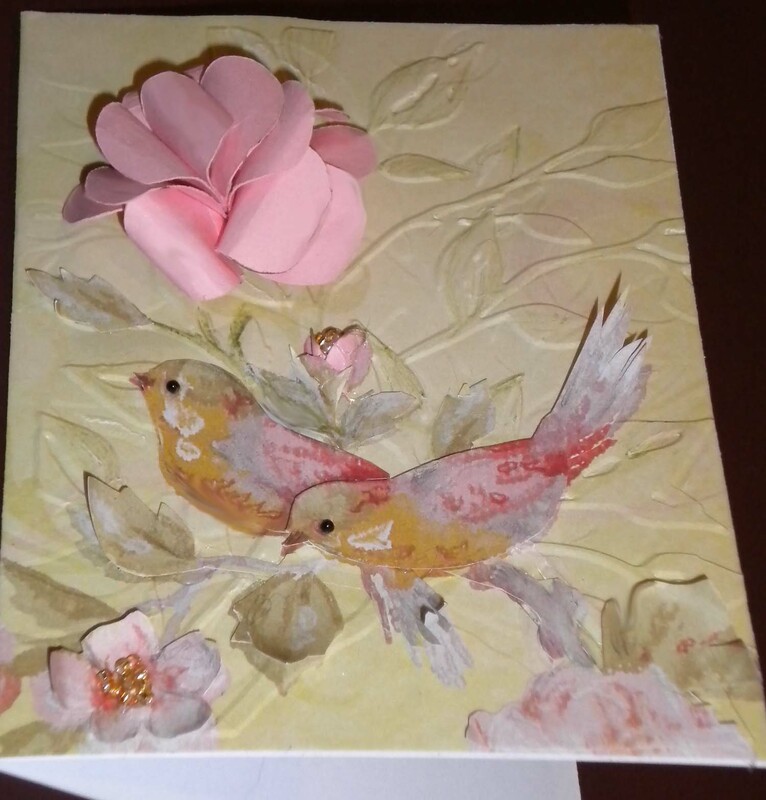 I put small black embellies on the birds' eyes, imprinted the inside of the card with a personalized message, and VOILA! This card would need a gusseted envelope or box for mailing, which would be a bit of a problem I suppose. I'm hand-delivering it with cookies, however -- so that's one way to solve that dilemma! WOW! This is beautiful. Lots of detail and lots of time! I really like your idea of debossing, then embossing - must try it. Thank you for sharing. Oh it is very pretty!! I never thought of running a paper through the cuttlebug to get an immage like that! Great Idea!! One I will be using! Ellen I just wanted to let you know that I have an award waiting for you over at my blog!! Keep up the great work! Oh my gosh!! That card is amazing. Thanks for the great idea. Must get a cuttlebug next month. I keep seeing all these beautiful textured ideas and I currently can't do them. Just started following your blog. Come on over and follow mine. Thanks.